← A bag or two for your perusal.. 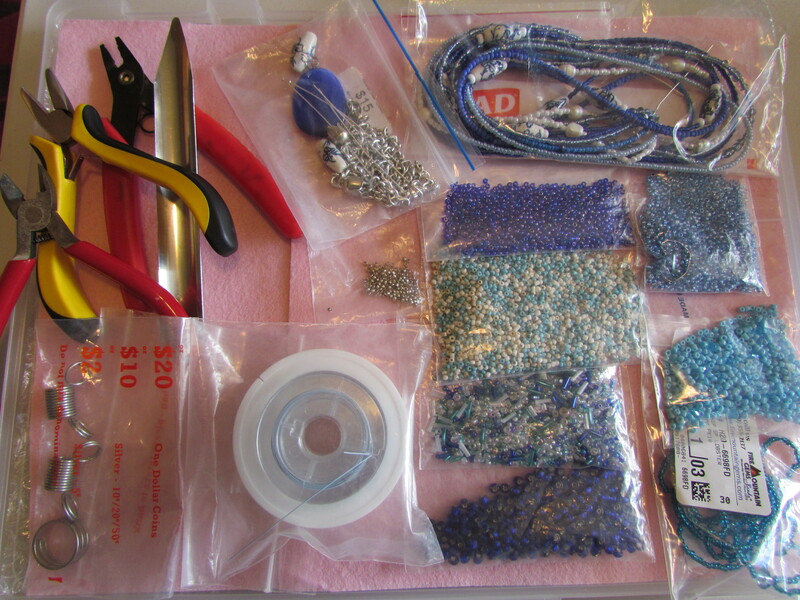 I have read a few posts lately from numerous blog and social media about beading on the go and how to pack everything for your markets. This got me thinking about a few things – mainly about what I was going to do on a Tuesday night. 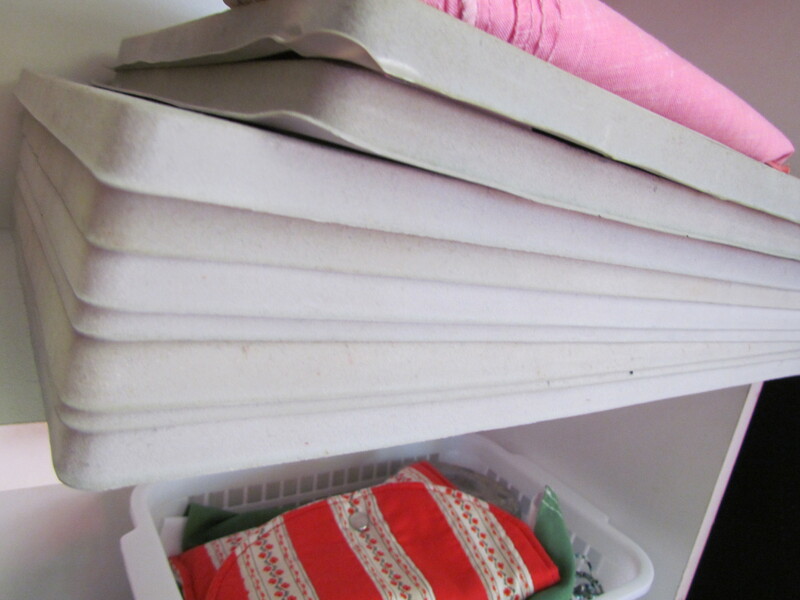 This will be the first in a 3 part post – portable beading, markets, storage at home (including what I’ve done in my room). Every Tuesday night my second son has his Air League meeting in town and while visiting friends is good, sometimes I just want to knuckle down and do something. Although it is fantastic what my son is doing if I am in ‘the zone’ then I feel that the 2 hours of his class is ‘wasted time’. A4 case for portable beading. 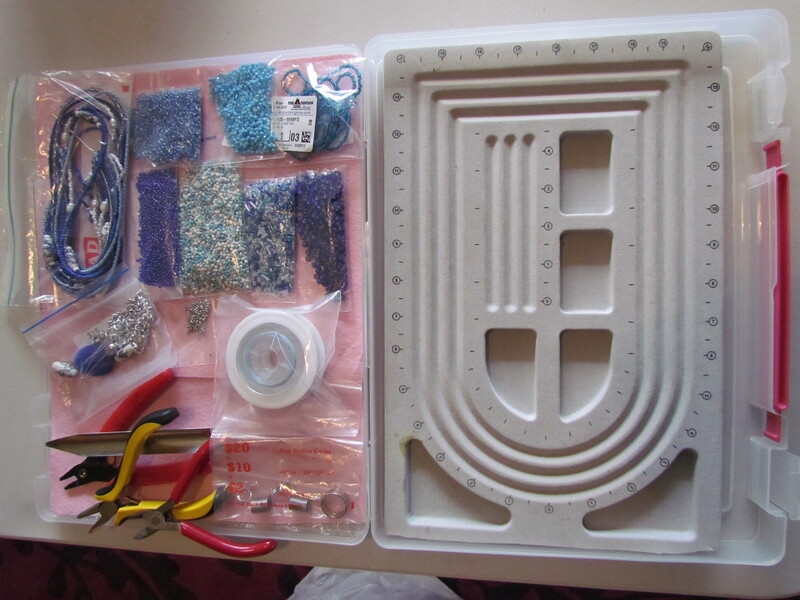 The idea is to have beads, wire & findings in their own snap lock bags, a bead board and 2 or 3 basic pliers ready to sit on my lap or a table and still be self-contained. As I have a project under way already it will be easy enough to organise for tonight. 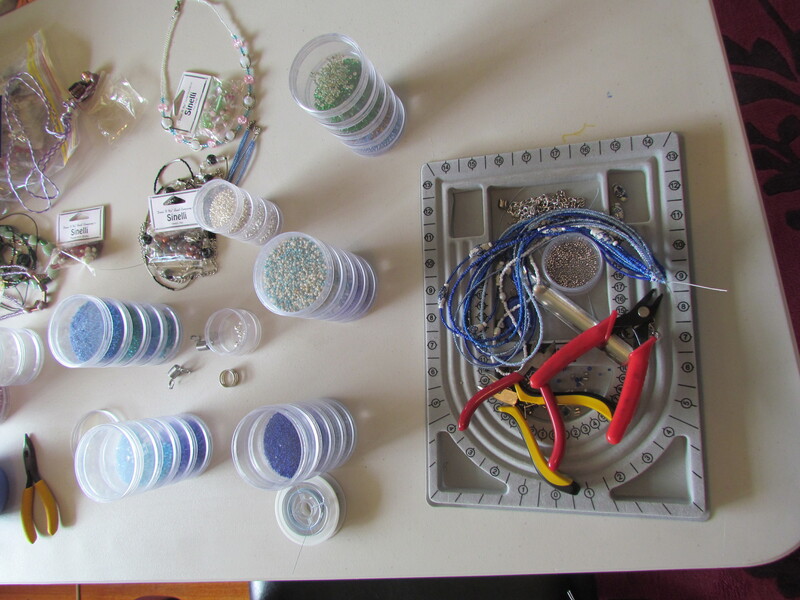 this is how I left it last night after beading in front of the tele... not really very portable, and a bit messy. 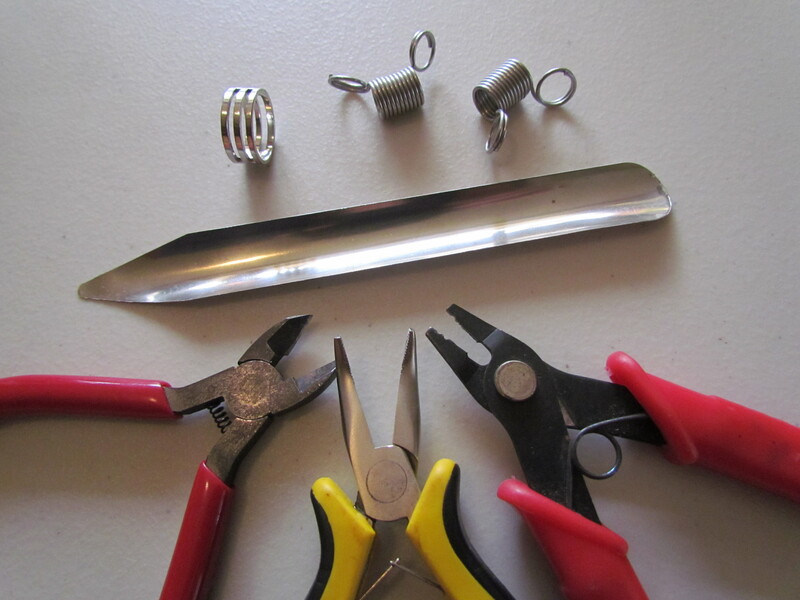 So, I need my basic tools: as shown below crimping and bent nose pliers and side cutters. Although using the bent nose pliers for squashing crimps (the tiny bits that hold the beads on) crimping pliers are much better. Then springy bead stoppers, and a jump-ring ring. Saves needing that extra hand when you don’t have one. And a simple bead scoop. Next, a bead board. I think that with 11 in total it’s not going to matter than I needed to cut the end off one to make it fit in. 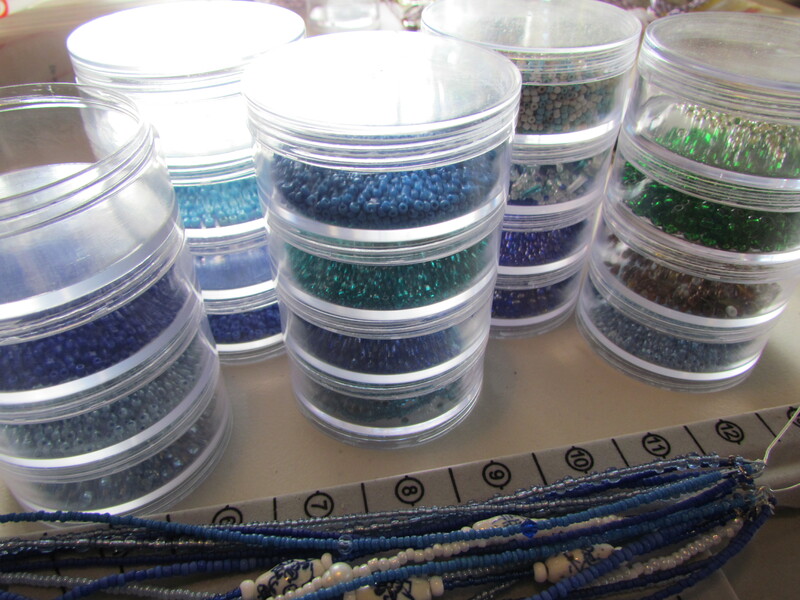 somehow I don’t think these bead containers are going to fit… so into snap lock bags go my seedies (seed beads). And the finished product: with bubble wrap and felt to help pad and protect. It all looks pretty good, so fingers crossed I come home tonight having accomplished something. 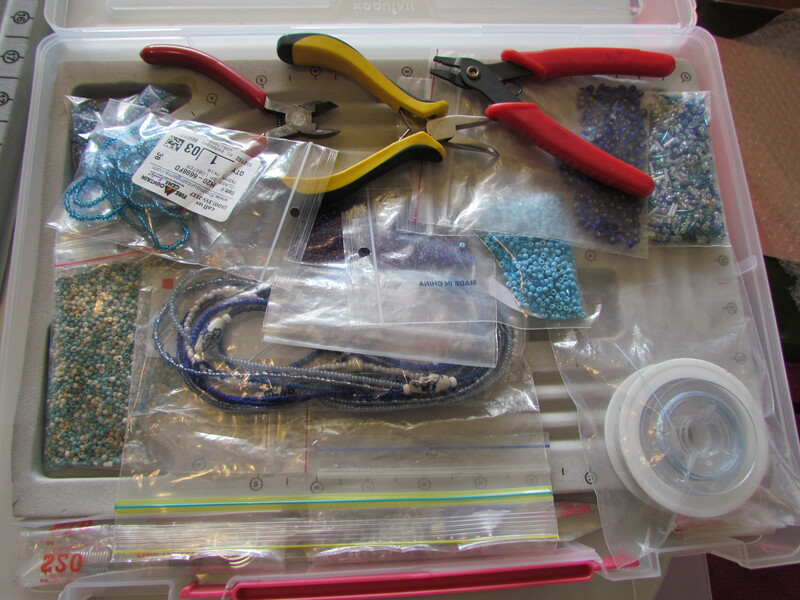 Tools, extra bits & findings (clasp etc) project part completed, bags of seed beads, 2 rolls of tiger tail (blue and silver) and lastly the tiny tools of bead stoppers and the ‘ring’ ring. What do you do to make your craft portable? This entry was posted in Beading, Marvellous Markets and tagged bead board, beads, bubblewrap, containers, felt, officeworks, pliers, portable beads. Bookmark the permalink. I’ve since added a basket full of goodies to my portable beading station which makes it much easier to take bigger and/or more beads and tools. As part of my storage and transport series. How very clever of you. Thanks for visiting my blog. Have you thought of using a small fishing tackle box? 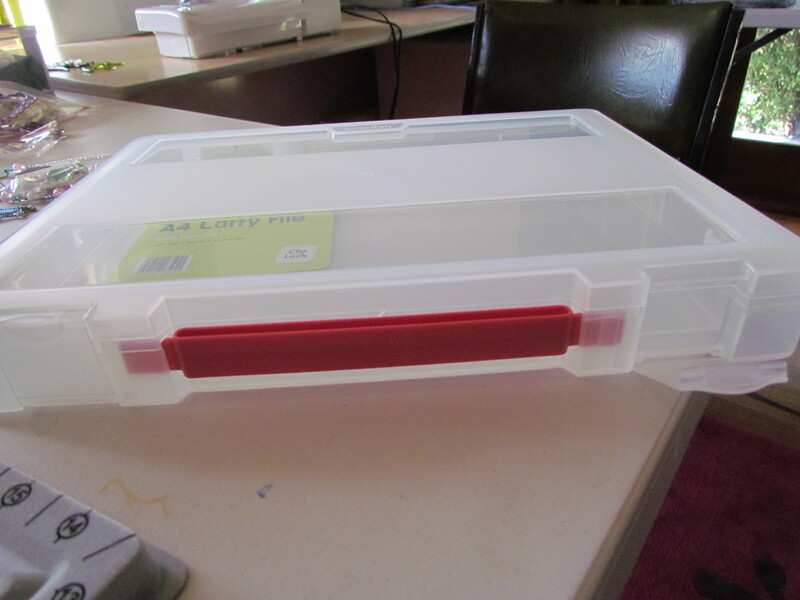 They often have small compartments with lids and a larger space for your tools. Vaguely, but I like my board too much. Thanks. Jen, you are a miracle of modern organization! Congrats! Lol, I have that case I re covered, which could work but I wanted something flatter that would hold a board. and it works a dream – love it!! !